Once again the exams will shortly be upon us and it’s a very busy time here in the library with study space at a premium. The reading room is pretty much full by 8 am and the library fills up fast too. All our study space are listed here and remember the 30 Minute Rule is in effect. If you leave a study space for more than 30 minutes another student can move your belongings to one side and make use of that space. And remember the Student Counselling Service is available for students experiencing difficulty at college. All the staff in the library wish you the best of luck with your exams and are here to help you with any query you may have. Be sure to give yourself some downtime during the Christmas break to recharge and be fighting fit for 2016. Thomson Reuters will be doing routine maintenance on their authentication system this Sunday, November 29th. Apologies in advance for any disruptions this may cause. Blackboard (VLE) is currently unavailable. ISS have opened a high priority call with our service provider and we apologise for the inconvenience caused. There will be a basic training session on the Endnote bibliography and citation software, with a focus on using Endnote in the context of economics research. Training will take place on December 8, 2015, at 10 am, in the Library training room on the main floor. Please sign up at the James Hardiman Library Eventbrite page if you would like to attend. Fold3 Library Edition by Ancestry provides convenient access to US military records, including the stories, photos and documents of the men and women who served. It contains millions of records from world-class archives. The Fold3 name comes from a traditional flag folding ceremony in which the third fold is made in honour and remembrance of veterans. Please complete the feedback form available from the link above if you review this resource. Microform Area - located on the ground floor of the Main Library. Take a right at Library/IT Service Desk and then left. If unsure please ask at the Library/IT Service Desk. Due to essential maintenance the Postgraduate Reading Room on Floor 1 of the Library will be closed on Friday 20th November 2015. We regret any inconvenience this may cause and thank you for your cooperation. This session is aimed at undergraduates but may have some value for postgraduate law students. There will not be time to cover more specialised formats. 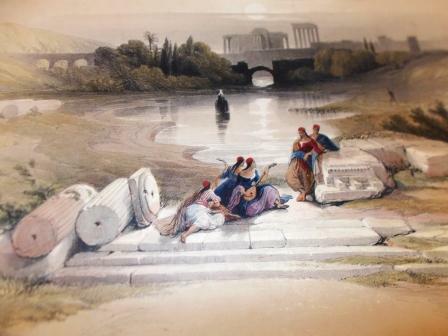 To celebrate Library Ireland week, Special Collections Librarian, Marie Boran, delivered a lunchtime lecture on a spectacular two-volume set, the tour and Illustrations of the Holy Land 1838-39 by David Roberts. Between 1842-1845 the Scottish artist David Roberts published two lavish volumes of lithographed prints. The prints depicted sketches made by Roberts on a tour which included Egypt, Sinai, Idumea (modern day Petra) and the Holy Land in 1838-39. Appearing in different editions the Roberts volumes are famous amongst book collectors, art historians and archaeologists for their depiction of places and historical monuments in the Middle East over 175 years ago. The James Hardiman Library holds a set of these rare volumes as part of its Ringling-North collection. The lecture celebrated the theme of Library Ireland week which this year was “A Library holds a World of Ideas” and the volumes can be consulted, among others from the collection, within the Archives and Special Collections Reading Room. You can find more information on these collections here. NUI GALWAY AND LYRIC THEATRE BELFAST IN A DRAMATIC COLLABORATION TO CELEBRATE THE LIFE AND WORK OF MARY O’MALLEY AND THE WORK OF W.B YEATS IN NORTHERN IRELAND. As part of the Arts in Action programme, two students from the centre for Drama and Theatre, College of Arts, Social Sciences and Celtic Studies at NUI Galway, Martin Kenny and Beau Holland with two drama students from the Lyric Theatre, Belfast, Luke Bannon and Sarah Blair, will work together with Caroline Lynch, Writer, Actress, NUI Galway graduate and Theatre Director, to present a new piece of writing based on the extensive archive of Mary O’Malley and the Lyric Theatre, which is held at the James Hardiman Library, NUI Galway and researched by archivist Barry Houlihan. This collaboration is a unique occasion for the student actors from Galway and Belfast to meet and work together on a project whose central character was full of determination and belief in the power of theatre to bring individuals together and turn them into a group whose power is greater than the sum of its parts. 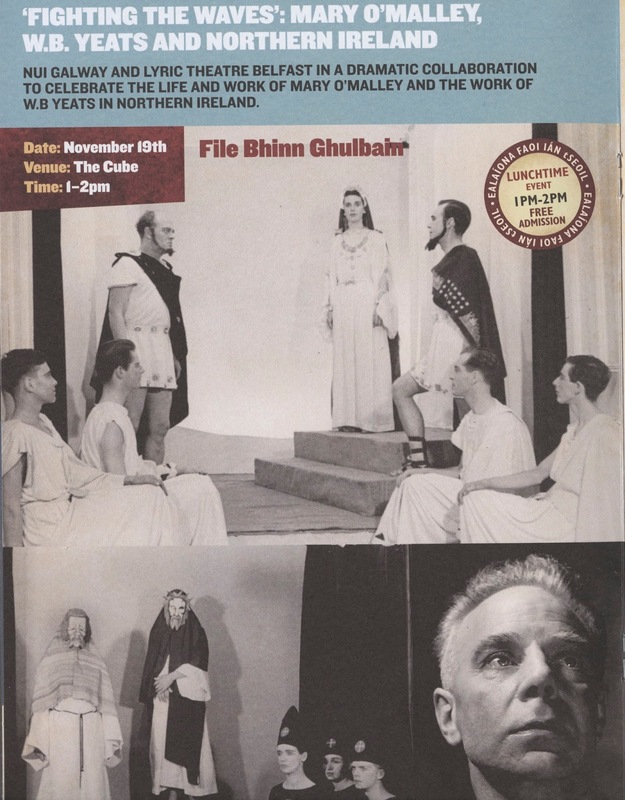 By exploring the Lyric Theatre archive of the James Hardiman Library, the story of Mary O’Malley’s journey and the history of Yeats’ work in Northern Ireland will reach new audiences in this the 150th anniversary of the birth of W.B. Yeats. The Lyric Theatre archive is a detailed record of the growth and development of the theatre and its founding director, Mary O’Malley. This event will mine and explore that archive, share new material and present a live event that will draw the audience into the Yeats-inspired Belfast and world of Mary O’Malley and the birth of a new theatre across a time of immense social, political and artistic change. 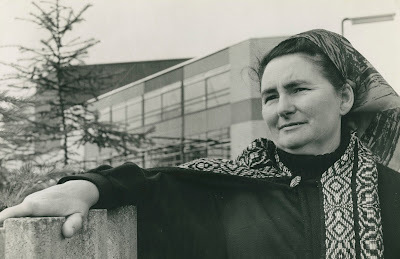 Mary O’Malley (Hickey), was born in Mallow, Co. Cork in 1918 and would develop from her childhood a life-long passion and enthusiasm for the theatre. O’Malley describes her “first big adventure” to the theatre being at age six and seeing Dion Boucicault’s Colleen Bawn at the local town hall in Mallow, and was “wildly excited by it”. O’Malley’s first visit to the Abbey Theatre, Dublin, aged thirteen, accompanied by her older brother, Gerard, allowed O’Malley to see W.B. Yeats in the flesh and experience being at the National Theatre. This would be the beginning of a continuous connection between O’Malley and the artistic and theatrical spirit of Yeats. Following a move to Dublin, Mary would meet Pearce O’Malley, a doctor and graduate of Queen’s University, Belfast and they married in September 1947 and moved to Belfast. It is in the O’Malley family home in Belfast that Mary established the Lyric Players. Along with a group of friends and family, O’Malley directed, designed and produced an extraordinary volume of work, beginning in 1951, notably the plays of W.B. Yeats and leading European playwrights which were not often staged in Ireland at the time. 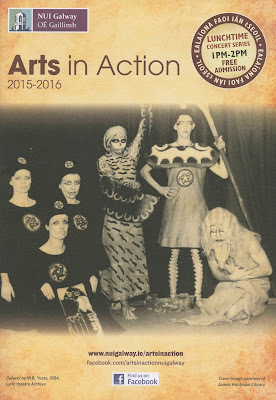 The first season in 1951 consisted of three plays, including At the Hawk’s Well by W.B. Yeats. Yeats was a foundational, constant presence and influence on O’Malley and the endeavours of the Lyric Players and the Lyric Theatre, from their journey of amateur to professional and forging ahead to become a ‘National’ theatre for Northern Ireland. The tension and fragility of peace and life in Northern Ireland was a further influence on the Lyric Theatre as it developed in the backdrop to the emerging Civil Rights movement and later throughout the Troubles. O’Malley would recount how at the point of breakdown of the Sunningdale talks in 1974, “In my bones, and for the first time, I felt a certain despair.” The political position of Northern Ireland and the ongoing conflict would resonate through O’Malley’s formidable personality and incidents such as controversy regarding the playing of the British National Anthem at the theatre, which would see O’Malley step-down from the Lyric Theatre Board for a period of time. The growth of the Lyric Players group to the Lyric Theatre as we know it today, from amateur to professional, is an incredible journey and which is dominated by the tireless work and vision of Mary O’Malley. The presence of Yeats is embodied in the Lyric Theatre. The growth of the theatre was a cultural revolution for Northern Ireland as much as the Abbey Theatre was in the South. We have encountered some issues with the service pack upgrade this morning, we are currently looking into these issues and will update everyone when new information is available. Our apologies once again for the inconvenience. On Tuesday, 17th of November from 08:00 - 09:00, the following Library services will be unavailable in order to facilitate necessary maintenance. On Saturday 14th November from 10am GMT – 2pm GMT the www.nature.com, www.palgrave-journals.com and www.palgraveconnect.com websites will be unavailable for scheduled maintenance. During this time content will not be accessible. We apologize in advance for any inconvenience this may cause. The libgate service has been restored and access to our resource has resumed as normal. Once again, apologies for the inconvenience, and thanks for your patience. We're working on it as a high priority and hope to have the problem fixed soon. Apologies for the disruption this is causing. 4. You will be left with a direct URL to the resource you're looking for. Press enter and you'll be brought through to the resource. Need help finding information sources for your Essay/Assignment? looking for books, journals, newspaper articles, etc. for Essays/Assignments. Email me in advance for an appointment.